The Republic P-43 Lancer was a single-engine, all-metal, low-wing monoplane fighter aircraft built by Republic, first delivered to the United States Army Air Corps in 1940. A proposed development was the P-44 Rocket. The Seversky Aircraft Company, which in 1939 changed its name to Republic, constructed a range of one-off variants of its P-35 design, featuring different powerplants and enhancements, designated AP-2, AP-7, AP-4 (which flew after the AP-7), AP-9, P-41; and actually built a carrier-based version designated the NF-1 (Naval Fighter 1). The most significant of these was the AP-4, which served as the basis for future Seversky/Republic aircraft. It featured fully retractable landing gear, flush riveting, and, most significantly, a Pratt & Whitney R-1830-SC2G engine with a belly-mounted turbo-supercharger, offering 1,200 hp (895 kW) and good high-altitude performance. The turbosupercharger had been refined by Boeing as part of the development program for the B-17 Flying Fortress, and the improved performance it offered was of great interest to other aircraft manufacturers. The sole AP-4 built was used as a testbed to evaluate means of improving the aerodynamics of radial-engined fighters. It was fitted with a large prop spinner and a tight-fitting engine cowling, following similar eperiments with the first production P-35. The AP-4's big spinner was later removed and a new tight cowling fitted. Unsurprisingly, these measures led to overheating problems. On 22 March 1939, the engine caught fire in flight, the pilot had to bail out, and the AP-4 was lost. Despite the loss of the prototype, the USAAC liked the turbo-supercharged AP-4 demonstrator enough to order 13 more in May 1939, designating them YP-43. The YP-43 differed from AP-4 in having a "razorback" fuselage with a tall spine etending back from the canopy. The engine air intake was moved from the port wing to under the engine resulting in the distinctive ovoid cowling. The aircraft was powered by an R-1830-35 14-cylinder air-cooled radial engine with a General Electric B-2 turbosupercharger generating 1,200 hp (895 kW) and driving a three-blade variable-pitch propeller. Armament consisted of two synchronized 0.50 in (12.7 mm) machine guns in the cowl and a single 0.30 in (7.62 mm) machine gun in each wing. The end result looked like an oddly proportioned P-47 Thunderbolt. The first of thirteen YP-43s was delivered in September 1940, the last in April 1941. Early testing revealed a strong tendency to yaw during takeoff and landing rolls, fied by redesigning the tailwheel. Although the aircraft eceeded the initial USAAC performance requirements, by 1941 it was clearly obsolete, lacking maneuverability, armor protection for the pilot, or self-sealing fuel tanks. 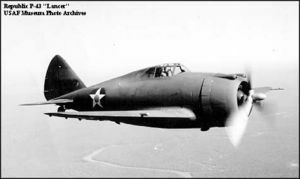 USAAC felt the basic P-35/P-43 design had ehausted its reserves for further improvement in performance and shifted its interest to the promising P-47. However, because the Pratt & Whitney R-2800 engine intended for the new fighter was not yet available, it was decided to order 54 P-43s to keep the Republic production lines operating until the P-47 was ready. Production aircraft were identical to the YP-43 prototypes and were delivered between 16 May and 28 August 1941. Ongoing delays in the P-47 program resulted in USAAC ordering an additional 80 P-43A aircraft with the R-1830-49 engine, giving better high-altitude performance, and 0.50 in (12.7 mm) machine guns replacing the 0.30 in (7.62 mm) in the wings. An additional 125 P-43A-1s were ordered for China through the Lend-Lease program, originally intended to equip the Third American Volunteer Group, a fighter unit like the famed Flying Tigers. These differed primarily in being armed with two 0.50 in (12.7 mm) machine guns in each wing and no fuselage guns, and having rudimentary armor and fuel tank protection. Actually, as delivered, the P-43A-1 had the same armament layout as the P-43As: four .50s, two in the cowl and two in the wings. Eternally, they were identical, and only the serial numbers distinguishes a P-43A from a P-43A-1. A total of 272 P-43 and its variants were built, a remarkable number considering the original intention was to not build any. Although the P-43 was clearly obsolete, Republic made one last attempt to etract more performance from the basic design by outfitting it with a Pratt & Whitney R-2180-1 Twin Hornet engine rated at 1,400 hp (1,044 kW). Contemporary drawings show an aircraft similar to the P-43 with a large propeller hub reminiscent of early Focke-Wulf Fw 190 prototypes. The USAAC was sufficiently interested to assign this AP-4J study an official designation P-44 Rocket and order 80 production aircraft sight unseen. However, combat reports from Europe soon made it clear that even this aircraft lacked the performance necessary to prevail in combat, and the project was cancelled with no prototypes built. A total of 54 P-43s were ordered into production instead to keep Republic production lines open. Aleander Kartveli and his team focused their efforts on the advanced AP-10/P-47 which eventually became the fabled P-47 Thunderbolt. The USAAC considered the P-43 and its variants obsolete from the start and used them only for training purposes. Several photo-reconnaissance aircraft were loaned to the Royal Australian Air Force in 1942 with none seeing combat. In fall 1942, all surviving P-43s were redesignated RP-43 indicating they were unfit for combat. Most of the aircraft that were not sent to China were modified for photo-reconnaissance duties and used for training. The Lend-Lease aircraft were delivered to China through Claire Chennault's American Volunteer Group, the "Flying Tigers". Pilots involved in the ferrying flights commended the P-43 for its good high-altitude performance compared to their Curtiss P-40s, good roll rate and a radial engine without the vulnerable liquid cooling system. Apparently, several AVG pilots asked Chennault to keep some P-43s but the request was denied due to the aircraft's lack of armor or self-sealing fuel tanks. Furthermore, the turbosupercharger proved unreliable and the "wet wing" fuel tanks leaked constantly. The P-43 performed poorly in combat in the hands of the Chinese air forces against Japan due to its great vulnerability; it was replaced by other aircraft in early 1944. Rudimentary protection added on the P-43A-1 was insufficient. In addition, the P-43's R-1830 engines were in high demand by the numerous Douglas C-47 transports in the theatre, effectively grounding the surviving aircraft. First production version, identical to YP-43, 54 built. Version powered by R-1830-49 engine and armed with 0.50 in (12.7 mm) machine guns in the wings instead of 0.30 in (7.62 mm), 80 built. Version for China, rudimentary armor and wing fuel tank protection, armed with 4 × 0.50 in (12.7 mm) machine guns in the wings, centerline hardpoint for an eternal fuel tank or up to 200 lb (91 kg) of bombs, 125 built. Photo-reconnaissance version with cameras in the tail, 150 converted from P-43A and P-43A-1. Photo-reconnaissance version differing from P-43B only in equipment, two converted from P-43A. Photo-reconnaissance version, R-1830-47 engine, si converted from P-43A. Proposed version with Pratt & Whitney R-2180-1 engine with 1,400 hp (1,044 kW), none built. - Davis Larry. P-35: Mini in Action (Mini Number 1). Carrollton, Teas: Squadron/Signal, 1994. ISBN 0-89747-321-3. - Swanborough, Gordon and Peter M. Bowers. United States Military Aircraft Since 1909. Washington, DC: Smithsonian, 1989. ISBN 0-87474-880-1.